In a marriage of quantum science and solid-state physics, researchers at the National Institute of Standards and Technology (NIST) have used magnetic fields to confine groups of electrons to a series of concentric rings within graphene, a single layer of tightly packed carbon atoms. This tiered "wedding cake," which appears in images that show the energy level structure of the electrons, experimentally confirms how electrons interact in a tightly confined space according to long-untested rules of quantum mechanics. The findings could also have practical applications in quantum computing. Graphene is a highly promising material for new electronic devices because of its mechanical strength, its excellent ability to conduct electricity and its ultrathin, essentially two-dimensional structure. For these reasons, scientists welcome any new insights on this wonder material. The researchers, who report their findings in the Aug. 24 issue of Science, began their experiment by creating quantum dots—tiny islands that act as artificial atoms—in graphene devices cooled to just a few degrees above absolute zero. Electrons orbit quantum dots similar to the way these negatively charged particles orbit atoms. Like rungs on a ladder, they can only occupy specific energy levels according to the rules of quantum theory. But something special happened when the researchers applied a magnetic field, which further confined the electrons orbiting the quantum dot. When the applied field reached a strength of about 1 Tesla (some 100 times the typical strength of a small bar magnet), the electrons packed closer together and interacted more strongly. As a result, the electrons rearranged themselves into a novel pattern: an alternating series of conducting and insulating concentric rings on the surface. When the researchers stacked images of the concentric rings recorded at different electron energy levels, the resulting picture resembled a wedding cake, with electron energy as the vertical dimension. 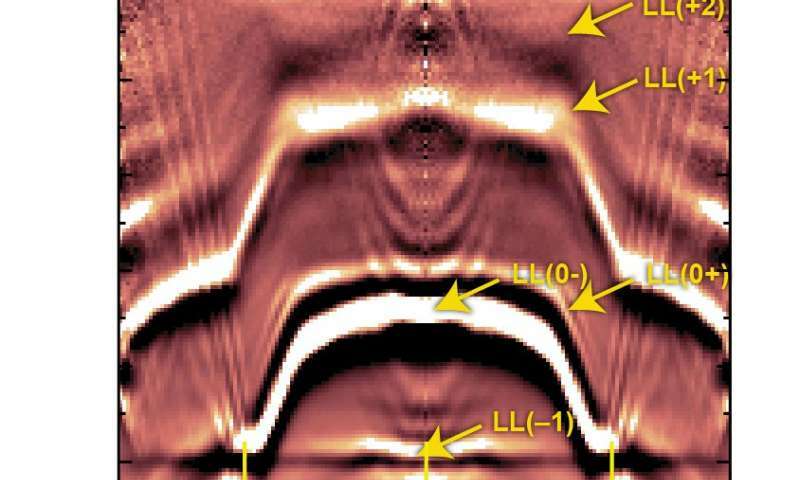 A scanning tunneling microscope, which images surfaces with atomic-scale resolution by recording the flow of electrons between different regions of the sample and the ultrasharp tip of the microscope's stylus, revealed the structure. "This is a textbook example of a problem—determining what the combined effect of spatial and magnetic confinement of electrons looks like—that you solve on paper when you're first exposed to quantum mechanics, but that no one's actually seen before," said NIST scientist and co-author Joseph Stroscio. "The key is that graphene is a truly two-dimensional material with an exposed sea of electrons at the surface," he added. "In previous experiments using other materials, quantum dots were buried at material interfaces so no one had been able to look inside them and see how the energy levels change when a magnetic field was applied." Graphene quantum dots have been proposed as fundamental components of some quantum computers. "Since we see this behavior begin at moderate fields of just about 1 Tesla, it means that these electron-electron interactions will have to be carefully accounted for when considering certain types of graphene quantum dots for quantum computation," said study co-author Christopher Gutierrez, now at the University of British Columbia in Vancouver, who performed the experimental work at NIST with co-authors Fereshte Ghahari and Daniel Walkup of NIST and the University of Maryland. This achievement also opens possibilities for graphene to act as what the researchers call a "relativistic quantum simulator." The theory of relativity describes how objects behave when moving at or close to light speed. 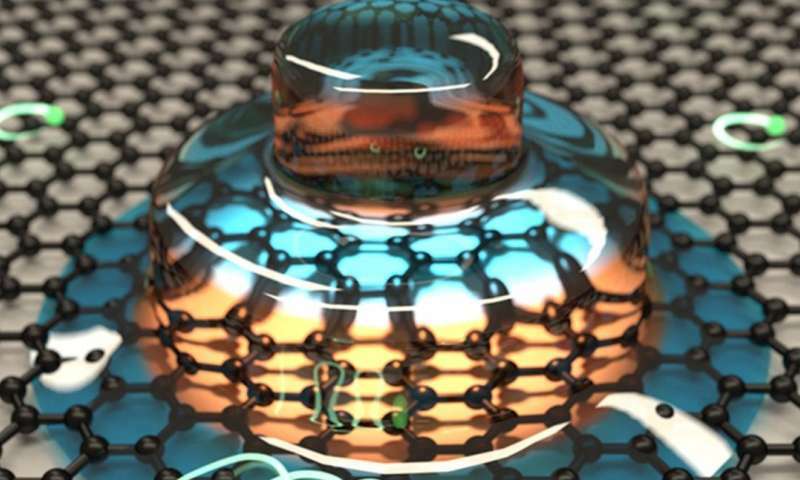 And electrons in graphene possess an unusual property—they move as if they are massless, like particles of light. Although electrons in graphene actually travel far slower than the speed of light, their light-like massless behavior has earned them the moniker of "relativistic" matter. The new study opens the door to creating a table-top experiment to study strongly confined relativistic matter. The measurements suggest that scientists may soon find even more exotic structures produced by the interactions of electrons confined to solid-state materials at low temperatures. just wondering if grephene could someday be used as the replacement for damages retinas. My neighbor's young son is slowly going blind from progressive pigmentation of his retinas.